I'm done with Ubuntu. I was only able to install it on one computer out of a dozen I tried it on, and on that computer it runs like treacle. Cold treacle. Cold treacle that keeps reporting a system error. Good news, though. HMRC Basic Tools (version 2013) runs on Fedora, even though it says it wants Ubuntu. or at least, I think it's working. Certainly it installed, and I was able to give it employer and employee details, but the proof of the pudding will be the first time I try to use it for an actual payday. And on Fedora, it runs adequately quickly. I have no idea why Ubuntu doesn't like me. Maybe I'll try it again one day. Other news - I ordered a box of 20 500-ml pump action bottles of alcohol hand sanitiser for use when I go out, want to eat lunch, and have dirty hands from caching - available on Ebay at a very silly price because they're dated 2011. But alcohol lasts, like, forever, the sell-by date is as meaningless as it is on a box of paper tissues. I used some yesterday, and I can say that it's miles better than the tiny bottles of gel you get, because it's actually liquid, and you completely wet your hands with it. Grapes - I've been buying two 500-gram packages of grapes to take when I go caching; one to eat with lunch, and one on the way home. The sugar content give me a good lift. But I discovered yesterday that where it says "70 calories" on the box, a more careful read reveals "70 calories per 100 grams", so what I thought was 70 calories, is actually 350. Oops. My finger splint arrived, and I've been wearing it ... sometimes. It does help when it's on, but it makes it hard to type. The back rack on my bike has slightly broken. It still works, but one of the sides has fallen apart and is now held together with wire ties. Since I'm riding over very rough ground and a totally broken back rack will leave me with a big problem if it happens in the middle of nowhere with two heavy saddlebags that can't be carried, I've ordered (on Ebay) a heavy duty (25 kilos) replacement. I had planned to go out today and do two circuits of 25 caches each, plus maybe another of 15. But I woke up at 7am, my back still hurt (a day on the bike is quite a strain on my back, I don't know why) and I felt really tired, so I went back to sleep for another five hours. Tomorrow we're driving down to London (no trains on Easter Sunday), so no caching for a couple of days. A few people have solved my Red Herrings puzzle - well done all of you. 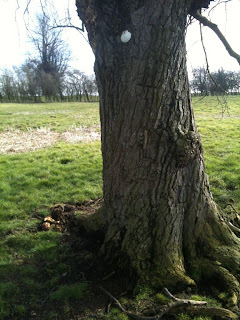 Today, I went to Great Gidding; I did a ring of 40 caches, plus another ring of 15. It was cold ... again. Will spring never come? One of the caches I tried to do, was buried under a ton of snow. The cache was supposed to be under bricks, but I couldn't even find the bricks. Another cache I did ... that's been a serial disaster for me. The first time I tried, I misguessed one of the numbers, went to a place that looked a bit plausible on the map, but was totally wrong. So then I went to the right place, and found the bridge I was expecting, but no micro. I went back after the cache owner replaced the micro, and that gave me the coords for stage two. But stage two was missing. So the cache owner replaced stage two, and today I went there again, on the bike ... and thereby hangs a tale. To do this cache, I'd relocated a drive of 20 minutes away, and when I got the bike out once I'd arrived, I immediately noticed that one of my panniers was missing ... the one with the battery that still had charge. I'd left it back at the first place I'd parked! So I used a much older battery, which I knew would only give me a couple of miles, and when I'd finished at this cache, I went back, and was glad to see my pannier was still there. Whew! So I biked down and quickly found stage two. That took me to a place where there was lots of wood, but no micro. So I phoned the cache owner, and got the coords for stage three. I found stage three, but it wasn't where it should have been, it was visible on the noticeboard. Stage four was another washout, nothing there, stage five likewise. At each of these failures, I made another call to the cache owner, who gave me the coords for the next stage. So at last, I had the coords for the final. But when I got there, where the cache should have been, there was a couple of tons of earth, dredged from the ditches nearby and dumped in the corner of the field. Another phone call to the cache owner. This has to be the only cache I've ever done, where I got five DNFs. I have no idea what they're trialling. That notice was the only thing I saw. 57 caches done today, and one DNF. The weather forecast said that it wouldn't rain, and it would be a bit above freezing, so I decided to go out. They were right about the lack of rain, wrong about the cold. It was still, very cold. Maybe a couple of degrees above freezing. 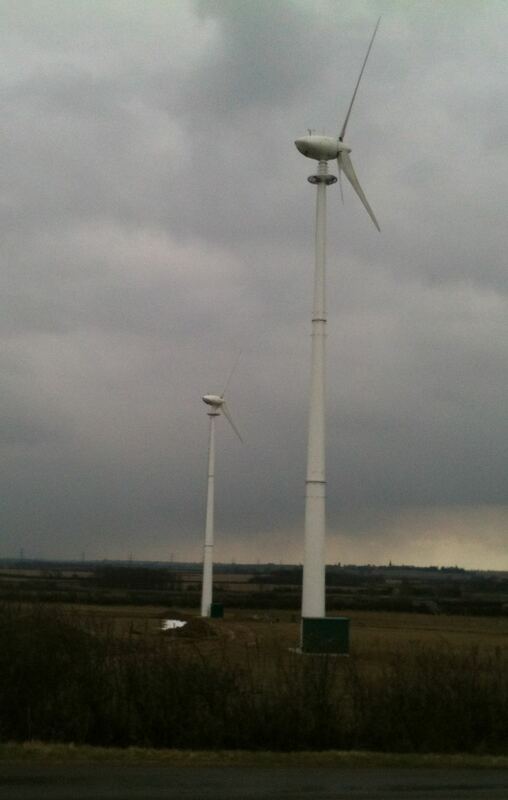 By the time I'd finished yomping around Yaxley on the bike, my tiny hands were frozen. At least it wasn't muddy. Yes, there was some mud, and a notable stretch where my boots sank in several inches, but when I'd finished the day, the bike didn't look too bad. She got a pressure wash anyway, because I need to do some maintenance. There was a horrible squeak from the front wheel, and although that stopped after a few hours, it makes me think that it needs oil or grease. And the back carrier has broken, that'll need a temporary fix and a permanent replace. 50 caches done today, and only one DNF, so a good day out. My new puzzle cache has now been published. Good luck with it! After a complaint to the Advertising Standards Authority, they've ruled that the spam I was sent is in breach of the CAP code; follow that link to read the ASA's ruling. This ruling says that it isn't enough to buy a list for emailing with the assurance that consent for the email was given - you have to be able to provide evidence of that consent. Usually what happens, is that some unscrupulous list vendor scrapes together a list from whatever sources they can find, such as email addresses found on web sites. Then they sell this list as being "fully opted in" or as "business addresses only" or even as "telephone verified". They don't care that the list is 99% rubbish. The person buying the list has no way of checking that it's as the list vendor says (and in some cases, the list vendor seems to go out of business every couple of months, reappearing under a new name) and isn't too bothered, because they feel that their message is reaching millions of people at a low cost. They don't make the connection that, just as they delete any spam they get unread, so will the people they're spamming. And people get the impression that anyone using spam to sell their services is in the same category as the vendors of Viagra and those who tell you that they have ten million dollars for you. In other words, not to be trusted. Would you trust a spammer? And so the spam business continues. The main losers? Actually, the spammers, who are paying good money for these lists that don't work, and which also put them in bad odour with the Advertising Standards Authority. The winners are the list vendors, who take the money and run. And us ordinary folks? We use spam filters, and don't actually see the spam or are affected by it. Unless we look at our spam folder, and complain to the ASA. 15 stone, 8 pounds. That's the result of two Seder nights. Round to brother-in-law.1 for the first Seder night. His back is giving him big problems, he could barely move! The chopped liver was great; the chicken soup and knedlach were superb. Tomorrow, we do Seder.2 at sister.1; she does a mixed Sephardi/Ashkenazi Seder, and always does great food. Maybe I've just been unlucky. But almost every time I try to install Ubuntu linux on a computer, the install fails. Whereas almost every time I try to install Fedora, it works fine. I'm trying to use Ubuntu 12.10, because the HMRC software wants to run under Ubuntu. And I've tried to install it on about a dozen different computers. It only installed on one of them, and on that one it runs like treacle. And the HMRC software doesn't work on Fedora. It seems to work, but as soon as I try to use it, it says it can't find an XML file (or some such error message that I can't handle). I can't believe that Ubuntu is usually like this - if it were, no-one would be using it. Maybe it's just the 12.10 version (although I also tried 12.04). It must be me. Ubuntu doesn't like me. However. I've put a temperature sensor outside the house, so that I can know how horribly cold it is without looking at the snow lying all over the place. The smallest finger on my right hand has been giving me trouble for a few months now. It's not very painful, but it sort of twinges when I use it for anything. I've been wondering what to do about it - I rather think that doctors aren't much use for things so minor. So I used Google, followed by Ebay, and I've bought a finger splint, on the guess that I've sprained or strained something, and it needs some support. Yesterday I was so tired! I had my blood test in the morning, picked up my regular prescription (Warfarin and Statin), had lunch and spent most of the afternoon asleep. Susan went to London to see the kids, had terrible train trouble on the way back (a train driver failed to turn up for work so they cancelled a train) and by the time she got home, she was too tired to cook, so we had a splendid meal from the nearby Turkish restaurant, the Village Mangin. That has become very popular (and rightly so), and it was absolutely packed; they'd even squeezed in an extra table. Today I woke up to a Winter Wonderland, snow all over the ground, so caching is out. 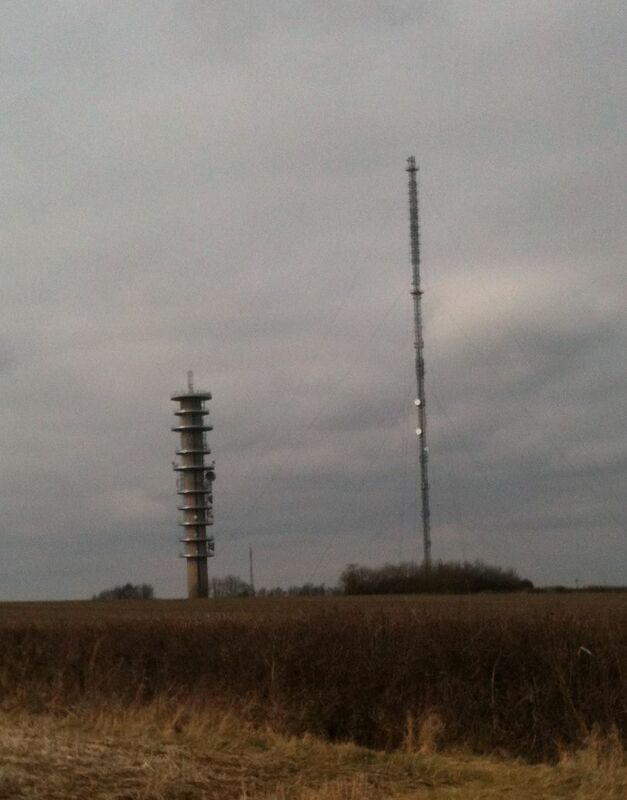 Whenever I see the Morborne transmitter, I think of Stan and Ollie. And I saw them a lot today, because I did the Transmitter Trail. I parked near number 1, got on the bike, and trundled round all 35 of them, plus a few extras. 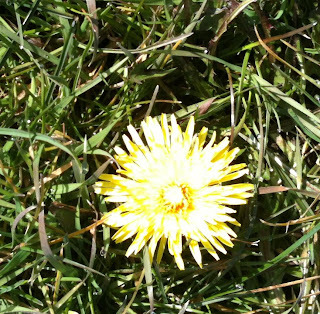 Today was the Vernal Equinox. Or maybe that was yesterday? 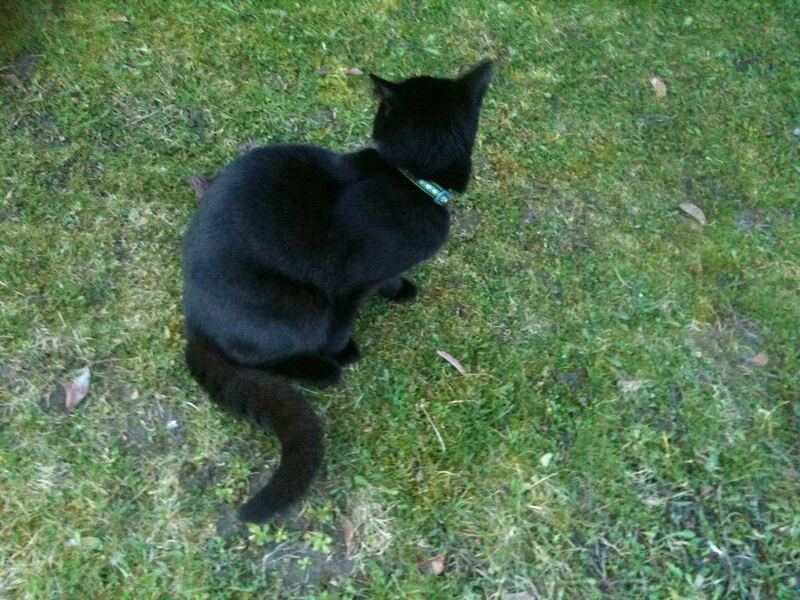 Anyhow, in honour of the start of Spring, I wore only one pair of trousers, although I still wore six layers of top! And I needed them, it got really cold today. 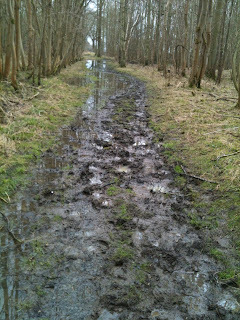 The ground is still very soggy, but as I was biking along next to a ditch, the recent work done by the farmer on clearing the ditch, had left so much mud on the grass that the bike picked up the mud, jammed it into the front and back wheel, and eventually brought me to a complete halt. I had to use my mud-removing tool (a piece of wood) for about ten minutes before I could carry on. And then I got to a field that I would have to cross, there was no way around it. A field with loose mud, and I knew that I'd have to stop every 10 yards or so and spend ten minutes freeing up the wheels. 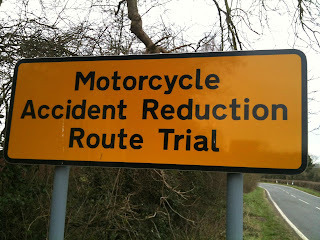 So instead, I took a very long way round. I headed for the nearest road, and that meant I could pick up several more caches that I'd planned to do a bit later. 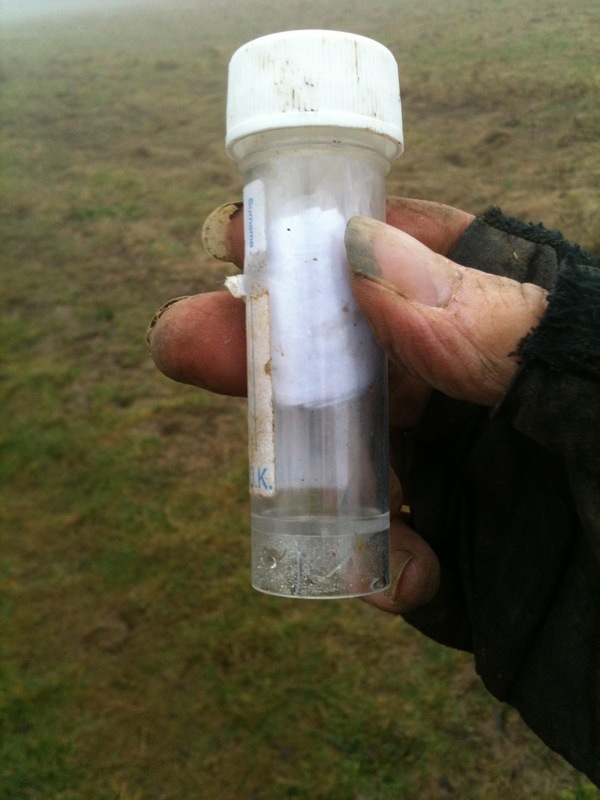 The last cache I did; the nearest I could get to it by car was about a mile. So I parked there, and biked the last mile, on a tarmac road that was gated against cars (but it was a bridleway, so bikes were OK). When I got to GZ, I couldn't find the cache, and it was getting late, time to go home! 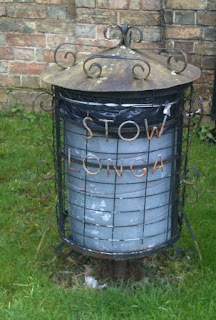 But I carried on looking long past the time I should have left - after trundling all that way, I just had to find it! And eventually, I did. Sixty caches done today. I'll have a rest tomorrow. Well, sort of. I have to have my quarterly blood test, I need to pick up my regular prescription, and I need to phone HMRC to ask them why I have to prepare not for a change on April 6, and they haven't yet made available the software I'll need from them, so how can I get ready? On the way up North on the M1, it rained. As I turned on to the A1M, it was a mixture of rain and snow. When I got to GZ, it was still drizzling. But by the time I actually got onto my bike, it had stopped raining, and it didn't rain for the rest of the day. Hurrah! 65 caches today, on the bike. I got 44 caches out of Battery 8, which I think is a record, then I switched to Battery 6, which only just lasted the rest of the day. It took me about six hours to go round, which is pretty good for 65 caches. Quite a lot of it was road, but there was also the usual soggy bridleway to contend with, and I had to wheel the bike across a couple of fields that looked like they might be the sort of clinging mud that jams up the bike, but which turned out to be not a problem. It meant that today, the bike carried me a lot more than I carried her. 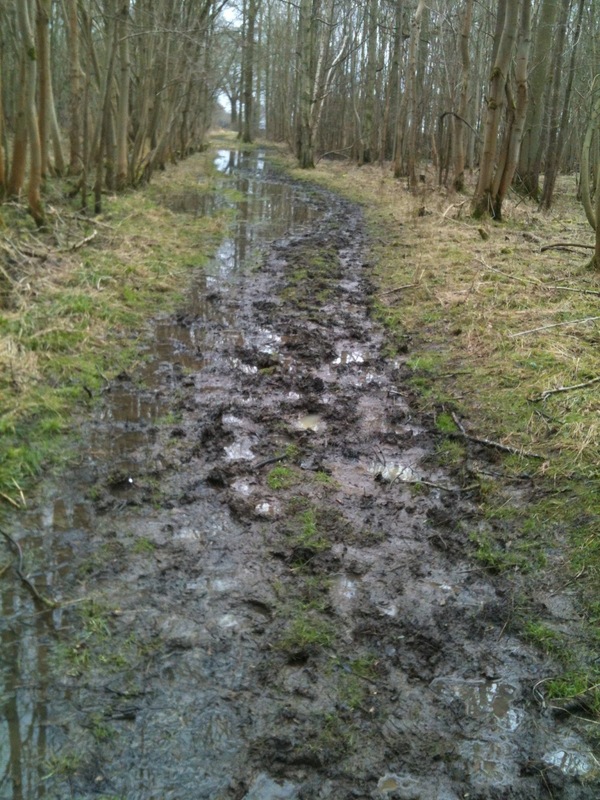 This is what a soggy bridleway looks like. Notice the way the water extends all the way from side to side, and when you aren't trying to get through a lake, you're inches deep in mud. Here's a notice I saw late in the day. 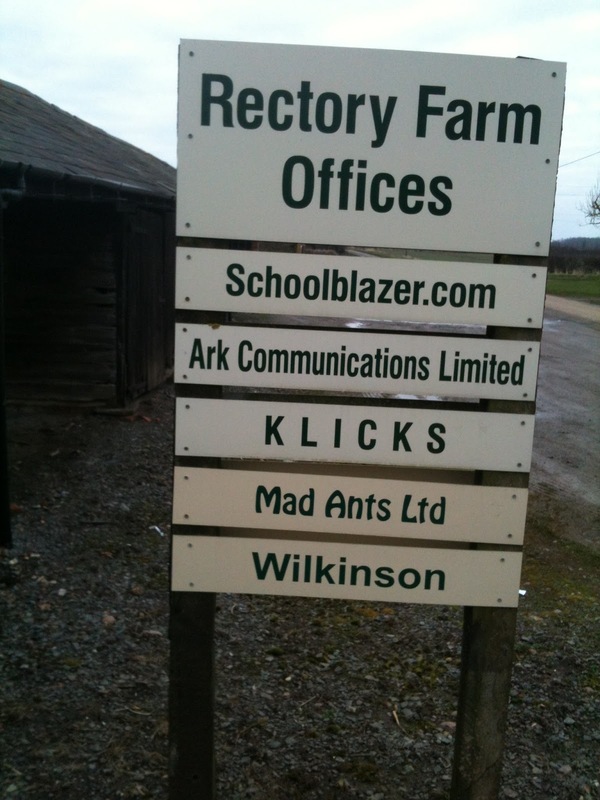 Schoolblazer.com is *not* a company that burns down schools for you. Mad Ants is a training company. 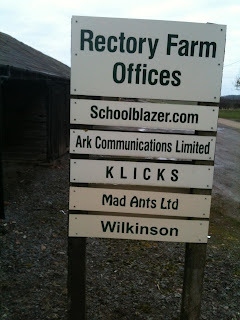 Klicks are kilometers and Wilkinson make swords. The bike did get excessively muddy, but I still gave her a pressure wash when I got home - I think she likes it. And I prefer riding a nice clean bike. 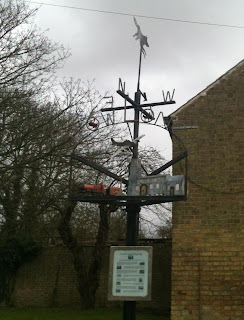 First, a circuit of 36 caches, plus a couple of extras, along the Lyvedon Way. Most of the track was pretty good, although wet. Some of it was so wet, that I was cycling for 20 yards, then through a puddle ... except that the puddle was a lake, six inches deep, with no way around it. So I just powered forward and hoped that I'd be able to get through and out the other end, because if I got stalled in the middle and needed to put a foot down, I'd have a bootfull of water. But I did managed to get through all of them; ther's mucst have been a couple of dozen..
Then up to Oundle, picking up a few along the way, and another smaller circuit. At the last cache I did, I couldn't find the cache, but while rummaging about under a hedge I found this. If he knew where the cache was, he wasn't telling. So I took a picture of him. So, 60 caches found today, my trousers are wet and muddy and I had to power-wash the bike. I seem to be doing that every day these days - it's all that mud. It didn't rain today. But it's rained so much recently that there were lakes of water all over, and when you bike through them, you get soaked. Imagine - you're biking towards a wide farm gate, but the whole opening, from side to side, is water, and there's more water extending beyond for about 30 yards. What do you do? What I did, was I rode at it as hard as I could, and although the wheels were half submerged, I managed to get through without having to put a foot down - if I had, I'd have had a bootfull of water. Here's something odd I saw. A shell nailed to a tree. I saw another similar shell nailed up later. I'm guessing it's some game I don't know about. 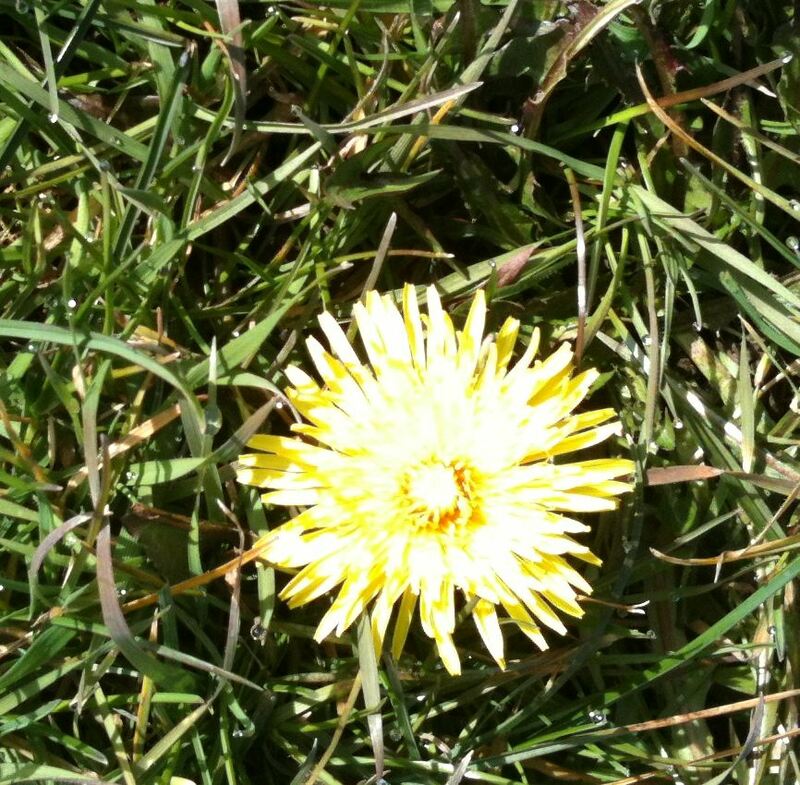 My first dandelion this year. I also saw more new lambs. 54 caches done today, no DNFs. And I cleared up a DNF from last time I was round this way. I am so glad I didn't go out caching today. I'm sitting in the warm and dry, watching as it simultaneously rains and snows outside. Big puddles all over the place, so that even if it doesn't rain tomorrow, the ground will be very soggy. On Saturday we went to London for a quiet time with daughter.1 and grandson.1, with additional visitation from daughter.2. Too much caching over the previous week caught up with me, and it was good to do nothing for a while. Today was forecast to be rainy, so I decided to spend the day doing urban caches - that way, I can get to shelter if it pours. But it stayed dry until the afternoon, and then there was only a light rain. 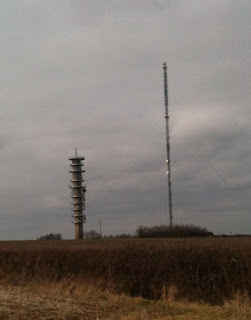 I pretty much cleared out Southwest Peterborough, but even better, I found two caches that I'd previously failed on. Another cache that I DNFed, I met the cache owner at a subsequent cache, told him about the DNF, he checked it, and texted me to say that it had indeed gone, but that he's now replaced it. So I was able to go back and get it. A slightly cunning ploy with the bike - instead of having two saddlebags to carry two spare batteries, I had only one saddlebag, with only one spare battery. This meant I could kick the kickstand down easily (with two saddlebags, I have to dismount and push it down by hand). I could do that because I knew I'd be getting back to the car before the second battery ran out. Going home, the tailgate got jammed closed; to get it open (when I got home) I had to clear everything out the back, then get in there and push it open with my legs. The A421 is usually almost empty, but today, there was a humungous jam, so much so that I switched off the engine, put my head torch on, and read my book about Barnes Wallis. Eventually, we crawled past the blockage, and I was able to see the cause. There was a dead horse lying in the road. My guess is that it fell out of a horse trailer. HM Revenue and Customs have come up with another rod for the backs of small employers like me. We do, of course, calculate and operate PAYE, because we have to. But now they're changing it. I got a letter dated 23 Feb, 2013 (but I didn't see it until 12 March) that tells me that from 6 April 2013 we have to report PAYE information in real time. So, every time we pay an employee, we have to, at the same time, report this to HMRC. I doubt if our elected representatives know about this, and I doubt if they realise how awful it's going to be for a great many people. I have to install new software (which, according to the HMRC web site) will not be available until 28 March. I then will have 9 days to install it, sort out any problems, and train myself and anyone else, in using it. Because I'm supposed to be using it from 6th April. They claim that they have a linux version, but they say it runs under Ubuntu. Actually, I think it will also run under Fedora, which is what I use - I think that, because I tried it and it works. But it wants Flash, and won't believe me when I tell it I already have Flash, so I'm using the html version (I'm using the 2012 software, not that I can use it for real, but just so that I can get a feel for how it works). It lets you install it to any directory you specify, which is nice, as I installed it on the network, which means that backups will happen, but then it keeps its data in a place that you can't specify, on my workstation, and I'll have to sort out something special for backups. I think that this is going to be no big problem for me, but I can't help thinking about millions of small businesses that have just been kicked in the shins by this new red tape requirement from HMRC. I looked outside, and the weather was bright, but I could see a lot of frost on the car, which means cold. So I put on my cold weather gear. As it happens, it wasn't that cold while I was out; I didn't need to wear my furry gloves. But it wasn't so warm that I felt like taking off any layers. I started off with a 30-cache series round Lutton, on the bike. The going was good until I got to the byway, at which point it suddenly became atrocious. There's a notice up at the start of the byway, asking that cars not use it so that it has time to recover. It hasn't recovered yet. But I'm not a car, so I tried to go down it. I had to walk the bike for about half of the byway, and then it got a bit better. Then on to a bridleway, which was a lot better, but then I encountered a stretch of sticky mud, and the bike got totally jammed up with it. And then road, lovely road. So the first 34 caches took me four hours, and then I did drive-by caches, as there were a lot lying around. 62 caches found today, no DNFs. And a power-wash of the bike, so I can go out again tomorrow. Out on the bike again today, risking the cold and snow. I wrapped up really warmly, which dealt with the cold. Actually, it was a bit warmer today; I didn't need my fur gloves, and spent most of the day wearing cycling gloves, which leave my fingers bare. It started off very well - a track through the forest that was almost as good as tarmac. Then it deteriorated badly for a mile or so, to the extent that I was walking the bike. But then it improved again, and I biked the last two dozen caches. I got back to the car at about 2pm and started lunch, and very soon after that, it started to snow quite briskly. But I was snug and warm in the car, ho ho, you missed me, too late! After that circuit of 44, I visited Thrapston to do several extras. Only one DNF the whole day, and 56 caches found. My new coat had its first outing, and it was just what I expected - same as the old coat, except not worn to a frazzle. To London yesterday to meet in-laws.2; lunch with daughter.2, fiance.2 and fiance.2's parents, who seemed jolly nice and of sound body and mind, which bodes well for fiance.2. But I ate too much. Then on to daughter.1 and gandson.1, where we had supper, and I ate too much again. All of which explains how come I was 15 stone 8 pounds this morning. This dieting lark isn't as easy as you might think. I also saw daughter.2's engagement ring, the diamond of which must have needed a fork-lift truck to lift. 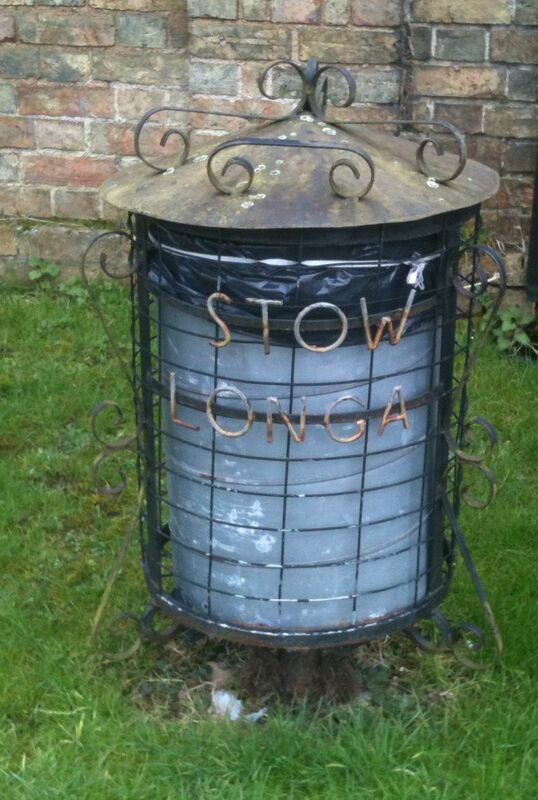 Actually, Thrapston, but it felt like the Arctic. Cold cold cold. I was wearing my leggings, shorts and trousers, two pair of socks and six layers above the waist. And my Biggles fur-lined helmet and sheepskin gloves. So I was mostly warm, but I had to keep taking my gloves off to write logs or operate the PDA, so my hands were getting cold. I parked at the start, and got on the bike. At the first cache I had to do a lift over a stile, and after the second cache, the same, plus a deep ditch to cross, with no bridge. I started to wonder if today was going to continue that way, but as it turned out, those were the only two lifts needed. On the other hand, when I got to the byway, it was so churned up by vehicles and horses that I had to wheel the bike rather a lot. There was also one stretch so bad that it was only my waterproof boots that stopped me getting a bootful of icy water. However - I saw my first lambs this year! When I got home, I wanted to give the bike a wash, but the hose was froze, so that'll have to wait. Last night, ladysolly and I went out on a night cache. She's not too keen on wandering around a forest at night, but I talked her into this one, on the basis that it was urban. It was a bit of a shambles from start to finish, but we got there eventually. * It keeps (some of) the rain out. DPM (disruptive pattern material) refers to the camouflage pattern; when I'm in woodland, I'm pretty much invisible. I've been three feet away from a muggle without being seen; the thing is to keep perfectly still and turn your face away. The sizes are 190 cm length, 112 cm (44 inch) chest. Actually, the 112 chest is generously cut, but the length is substantially less than 190 cm; the 190 refers to my height, not the height of the coat. 190 is six feet three inches, which is a few inches more than I am, but I prefer the coat to be longer, as it's knee-length. I also have a 190/120, which is miles too big, but not so I can't wear it. I need two such coats, because if one gets soaked because I was out in the rain, then by the next day it's still wet, and I need to wear a spare. The pockets are great. It has two deep side pockets that are easily accessible, two top pockets which can be buttoned down to avoid losing stuff when I bend over, a poacher's pocket in the back, good for stowing any dead rabbits I find ... actually, I use it for my climbing rope. and a couple of other minor pockets that I don't use. In addition I have a waterproof in the same camo colouring, with a hood, which is very light (no good for warmth), but which keeps the rain off, so is good for summer if it's raining. And I also have a desert-camo coloured coat, with hood, warm and waterproof. I don't use that much, because I don't mind being out in the cold, and I'll tolerate being out if it's raining a bit, but if it's both cold and raining, I'd rather not go out. Recently, I noticed that my British army combat smock (temperate) DPM, size 190/112 is almost worn out. There's lines where the fabric is simply not there, and although the coat is still operational, I can see a time in the not too distant future when it will simply fall apart. So I replaced it. On Ebat, I found a British army combat smock (temperate) DPM, size 190/112 for £18, in good condition "looks as good as new", so I've ordered it, and I'll be retiring the coat that's falling apart. It served me well over six years and 30,000 caches. For the last 15 years, whenever I wanted to copy one server to another (usually for backup), I've used mirror.pl, a program written in 1991 and not updated since. It's worked fine. I've also used gencopy, a program that I wrote for doing the same thing. But recently, mirror.pl was having a lot of difficulty with one particular copy, so I fired up google to look for a possible alternative. That led me to rsync. I've heard of it, but I was never interested enough to find out what it was. I discovered that it does pretty much everything that mirror.pl does, plus I think it's faster, plus it works on the server that mirror.pl was having trouble with. rsync is installed as standard on every Fedora install, and on raspbian you get it with apt-get install rsync. I think I'll be using it a lot in future. Today, I did my 30,000th cache. I went north again, to do a ring near Thurning. On the bike, even though the ground was wet. The first dozen or so caches were on a track that had been thoroughly chewed up by horses (plus it was rather soggy), and it was a major effort to bike along it. But after the first dozen or so, the track improved, and by the time I was in the last dozen, I was on a very good surface, so I simply bowled along. There wasn't any rain until I got back to the car, but it was very misty; visibility was about 100 yards. As you can see, it's a urine specimen bottle. There's probably a message there, but I'm not going to spell it out. To celebrate the 30,000th cache, I've ... set a cache, GC479ZA. It's an easy find (although a bit prickly) but there's a catch. You can only log it if you've found 30,000 caches. I can't log it, of course, but there's 38 people worldwide who could, and that number is growing all the time. Up north again today, and it rained the whole time I was driving north. First I stopped off along the way to have another go at a cache I DNFed a while ago. I think the coords had been updated, because the GPS took me to a place a fair bit from where I was before, and I made a quick find. Then on to the first main event; I did a circuit of 26 caches near Upper Dean, on the bike. The ground was wet although not too soggy for biking, and it had stopped raining. I found all 26 caches. 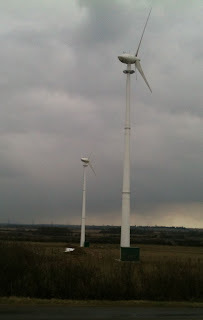 Then, after lunch, I popped across the A1(M) to do another series of 26 on Sawtry Fen. I wasn't sure whether to do this on the bike or on foot, as it had started to rain lightly - I decided on the bike, and I was glad I did, becuae the going was pretty good. That's another 26 caches. Then in to Sawtry, to polish off a few that were there, and then a few of the Woodwalton Waggle that had been relocatred and given new cache numbers. Finally, I attempted the Baker's Dozen GC3HQAR that I'd tried once before. This time, the first micro was in place (it had been missing before) but I couldn't find the second micro, and I suspect that's gone. Plenty of mud on the bike, so I gave it a power wash before putting more oil on the chain (power washing seems to drive the oil off) and putting it in its stable. 72 caches done today - pretty good! I've been here before; there was an excellent series of tricky caches called the "Kimbolton Konundrum" which I did with Simply Paul. Those have been archived now, and today I did the new series round Kimbolton, on the newly-repaired bike, which I must say performed flawlessly. I also met Jeff Bones and Zensunni while I was out - they saw me making a getaway from a cache by a bridge. Jeff phoned me up and we met up near an obelisk for a chat. I also got the bonus for the "Hills of Hunts" series, and then went on to get the bonus bonus. A good day out, finding 52 caches. I got home early, which was good, because in the morning, when I tried to do my daily pre-outing routine, I found that my internet connection was so saturated with data flow, anything I tried took ages, so I simply didn't do most of it, hoping that by the time I got home, normal service would be restored. And it does seem to be OK now, but I wish I knew what the cause had been. The bottom bracket on my electric bike was a bit wonky. This afternoon I'm visiting the dentist (a filling fell out, no big deal) so this morning, I decided to tackle the bottom bracket. The bottom bracket is the main bearing and shaft that the cranks are attached to. The cranks are the things that the pedals are on. So you can see, it's a pretty important element of any bike. And it was wobbling. Wobbling probably means that there's something wrong with the bearings. But these days, you don't replace the bearings; the whole bottom bracket, shaft, bearings and ball-race, is one sealed unit. And it just so happened that I had one, left over from an abortive attempt to repair a previous bike (the bottom bracket didn't fit into it). So, first I removed the cranks; to do this, you use a special tool that screws into the cranks, and then you screw a nut that slowly extracts the cranks. That worked well. Then I removed the bottom bracket. To do that, you need a special tool that engages with a slot on the collar that keeps it in place, and then you can turn the collar and unscrew it. At that point, several ball bearings fell out and lost themselves amongst the gravel. But I didn't really care, I wasn't going to be reusing those. I was able to pull out the crankshaft, whch looked terrible, and the ball races which looked even worse. Then I had to take off the other side of the collar that keeps the crankshaft in place, and that needed a special tool; a 36 mm spanner. Which I didn't have. So, a trip down to the bike shop and £18 (which I have to say seems like a lot for a spanner) and I had the right tool. And with that (and after remembering that it was a left hand thread, so if you tried to unscrew it in the usual way, you were actually tightening it), I got the second collar off. Then I tried to put the replacement crankshaft on the wrong way round. 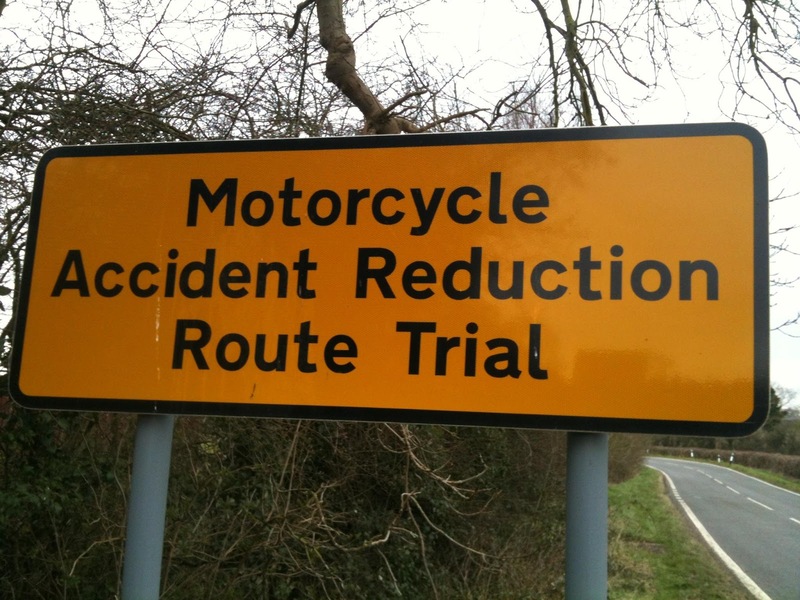 It's clearly marked with L and R, but I had the bike upside down, which meant that L and R were the other way round. Soon, I realised this, and put the replacement crankshaft on the right way round. And then I used the special tool to tighten it up. Replacing the cranks was easy, and for once, didn't need a special tool; I tightened the cranks on by doing up the bolt that holds them in place. I oiled the chain, because it needs oiling every so often, and scraped the mud out from inside the handlebar. The key for the motor had fallen apart, so I repaired that using a length of spoke. And now we're ready for another bike trip around Huntingdonshire. I've ordered an 18 inch adjustable spanner from Ebay, with jaws opening up to 50mm. Next time I need a spanner bigger than any I have, I'll be ready. Also, I did a bit more research on bottom brackets, and I'm not sure that the one I installed has the correct length. If it's too long or too short, the back gears won't line up with the front gears. So I took the bike out for a quick ride test, and apart from the gear change cable needing to be adjusted, I think it's all good. North to Huntingdonshire again today - one of my favourite counties, on account of the flatness of the land and the lack of stiles. On the bike, and I did 60 caches, incuding a rather tricky multi. The weather started cold, but warmed up so much I was even thinking of taking one of my five layers off! I got round the 51-cache circuit is about 5 hours, then hopped around to do another nine. Tomorrow will be a rest day. I found a more minimalist OS load for the Pi, so I tried it with a 512mb SD card. Sadly, that wasn't enough. So I'm trying it with an 8gb SD, to see how much it actually uses. This is using the ordinary Debian method of installing, and it should mean I can load up without putting on the software I'm never going to use (such as the X user interface). You can see the Raspbian installer here. Down to London with ladysolly to see daughter.1 and grandson.1. I had a nice reminder why I don't want to live in the middle of London, or in a flat. Next door to daughter.1 they had a housewarming party, and as the guests left, they made a terrible racket in the corridor and woke everyone up. But she said she also gets street noises whenever there's any sort of street celebration, like after a football match. And on the way back, a good reminder about why I didn't like commuting. The Met line was closed for repairs, so the Chiltern was very crowded, and we only just managed to get a seat. Out today in the weak March sun on a circuit of eleven caches near Doddinghurst; excellent caches, no "piles of sticks". We found them all, then went on to the village nearby, where we had less luck, 17 caches done today. Tomorrow we go down to London to visit daughter.1, grandson.1 and, if we're lucky, we'll get a fleeting glimpse of daughter.2. I've been promised a Japanese lunch. I complained to the Advertising Standards Authority about a spam email. It's advertising, so I thought it might come within their remit. My complaint was that the email was sent to me unsolicited, in violation of the PEC regulation (2003). The ASA contacted the spammer. The spammer said that they got the list of email addresses from a list provider, so it wasn't their fault. The opinion of the ASA is that, under the CAP code, marketers are required to get explicit consent before sending marketing emails. And the ASA say that it's still the responsibility of the spammer to ensure that the consent is there; they can't cop out by saying "not my fault, I bought a list in good faith". When the ASA publish this ruling, I'll be able to cite it to people who tell me "not my fault, I bought a list in good faith". Meanwhile, the people who spammed me are having their knuckles rapped by the ASA. I don't suppose that will make much difference, but if enough people complain, maybe it will. 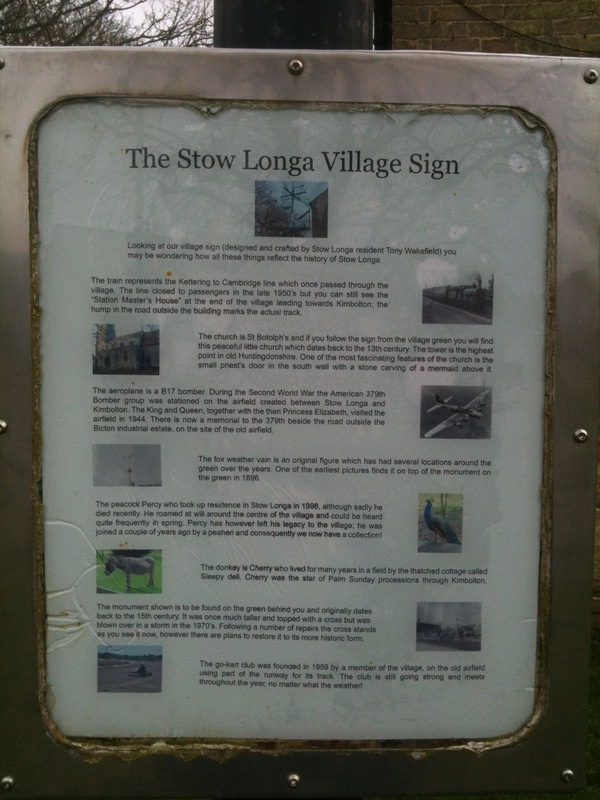 Out to Stow Longa today, for a day on the bike. Two great things about biking in Huntingdonshire - there's no hills, and there's very few fields with animals. It's not that I mind sheep and cows, but the lack of farm animals means that you get very few stiles to deal with. And here's the explanation of what the elements represent. I got round 46 caches in about four hours; that included a one-kilometer diversion to pick up a "Woolley Mammoth" cache (I've already done that series, so this one is an extra. And to my surprise, no-one else had done it yet, so I got a First-to-find. It's pretty rare that I get a first-to-find, usually the local First-to-find fiends grab them a few minutes after publication. After I finished the route, I did a few more to bring the number today up to 50. The bike performed well; I'd replaced the rear brakes yesterday, and although the main bearing is still slightly wonky, it's not so bad that it's a problem just yet. But the key for the power has fallen apart. I'll have to use a pair of pliers to turn it, if necessary. When I got back to the car, at about 14:30, and while I was eating lunch, it started raining, so I got round just in time. But then another problem cropped up - I wasn't getting electricity out of my inverter, the thing that transforms 12 volts from the car battery, to 240 volts, so that my various gadgets can run. I tracked it down to A) the fuse in the inverter had gone, and B) when I replaced that, the inverter itself refused to run. So I'm now using my backup inverter, and I've ordered a new backup - they really are so cheap these days; about £12 for a 200 watt model (which is really the maximum you should take). 50 caches done today, no DNFs, and one FTF. A good day out.